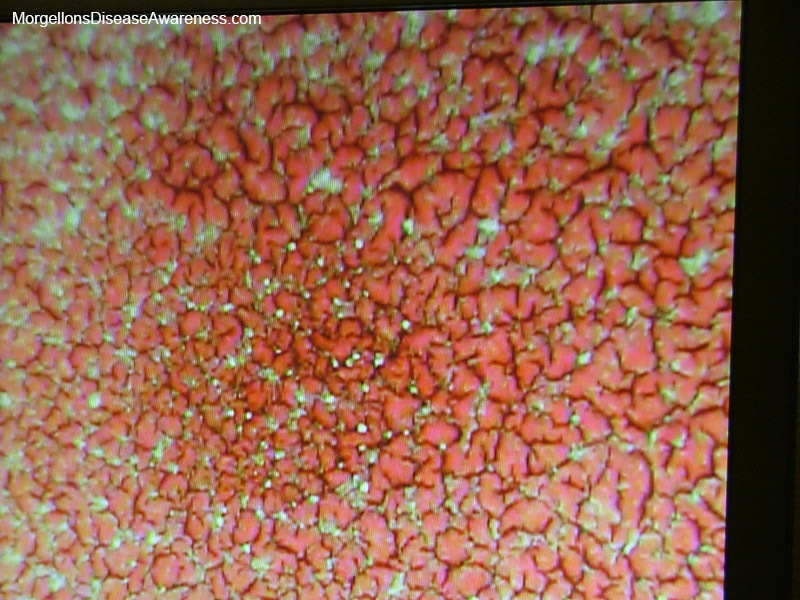 On Sept. 8, 2012 I had a live blood microscopy with Rick Panson, a microbiologist, at the Live-Live store in NYC. 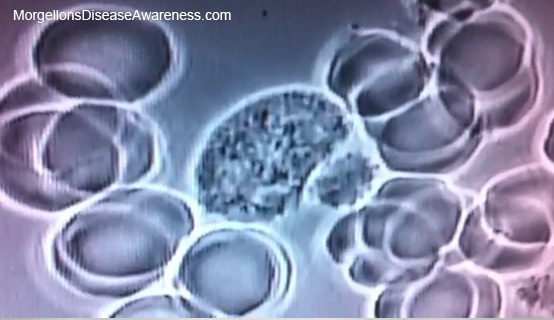 Rick has been doing live blood analysis since 2005 and works as a healthy body coach. He spent an hour going over what he saw in my blood as well as giving me pointers that would move me into a greater state of health. It was incredibly informative helping me explore new directions to pursue. It is one thing to have lab work and testing, and quite another to witness firsthand what is transpiring in your blood. Many thanks to Rick for going the extra mile and providing photos. His comments are in red and italics. On Nov. 16, 2012 I saw Rick again for a second session. The results are posted following the chia seed information. 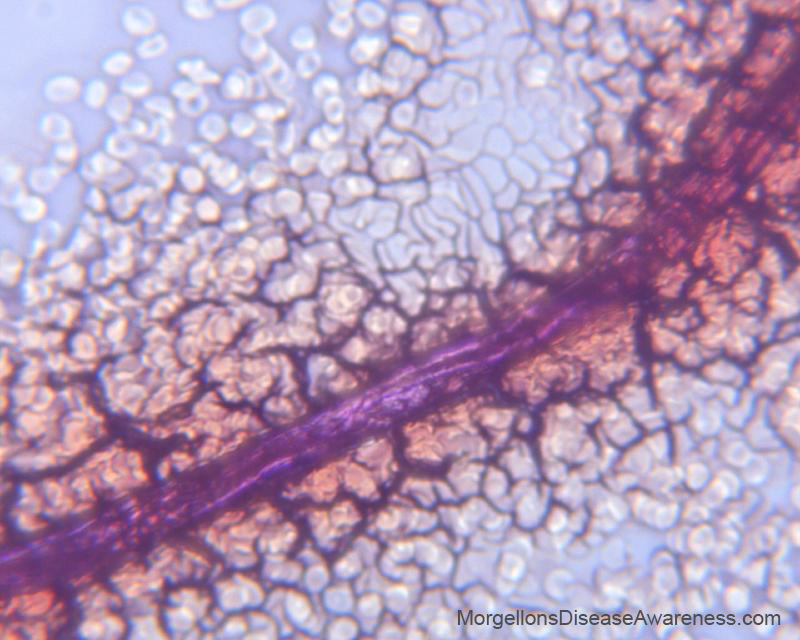 At the bottom of the page are images that various people suffering with Morgellons graciously contributed to this site. A note on the photos. Rick provided me with photos for this page and I've filled in some of the gaps with screen grabs taken from the video that was taping our session. Heterogeneous symplasts The tiny white dots in the clump are yeast/candida. 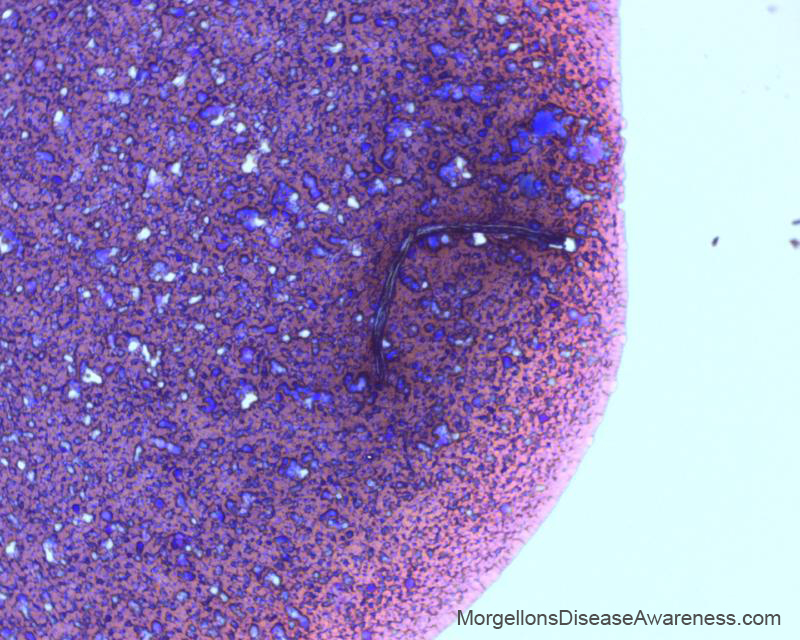 There are several stages of microorganisms﻿ here which include yeast, bacteria and fibrin, fungus and mold. A condition of acidosis is causing this. 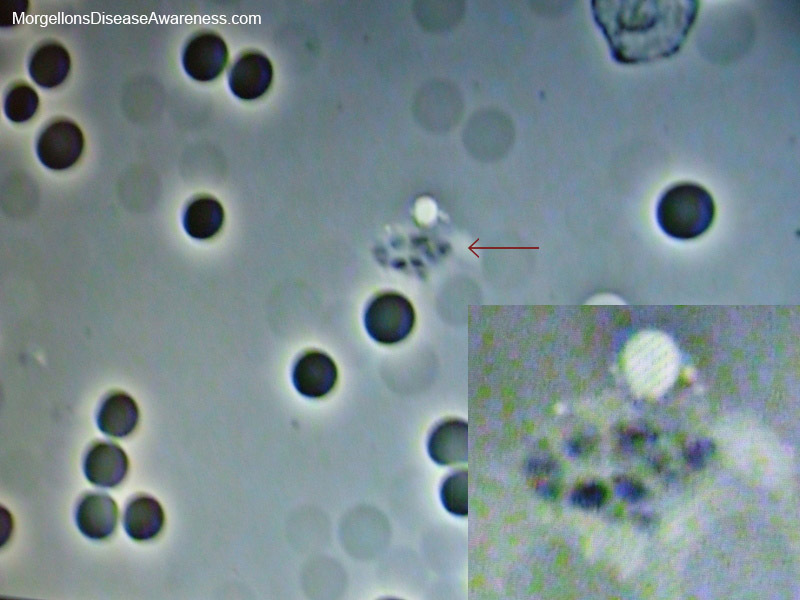 Ghost cells The dark black cells with the halos are red blood cells. 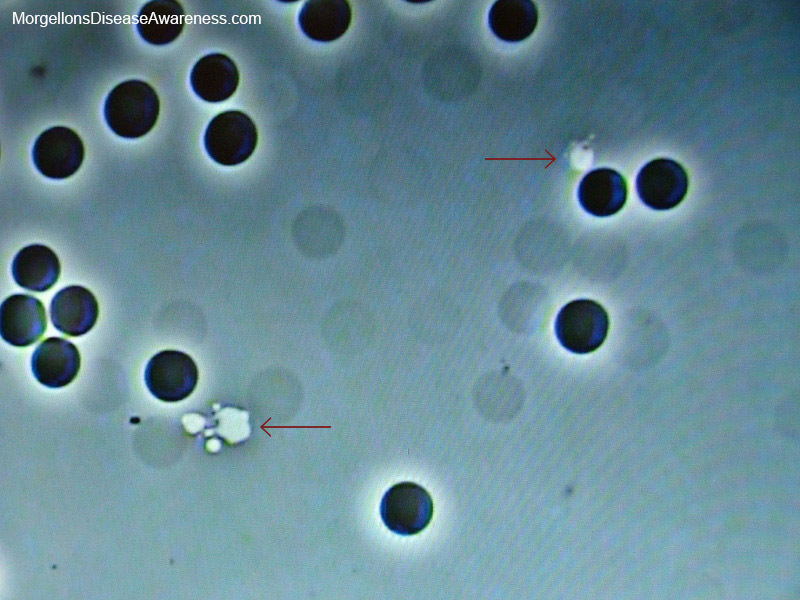 In the background are 'shadow cells' which were healthy red blood cells that 'popped' due to the loss of their phospolipid membranes. This can occur from an acid producing diet, and poor assimilation of nutrients. 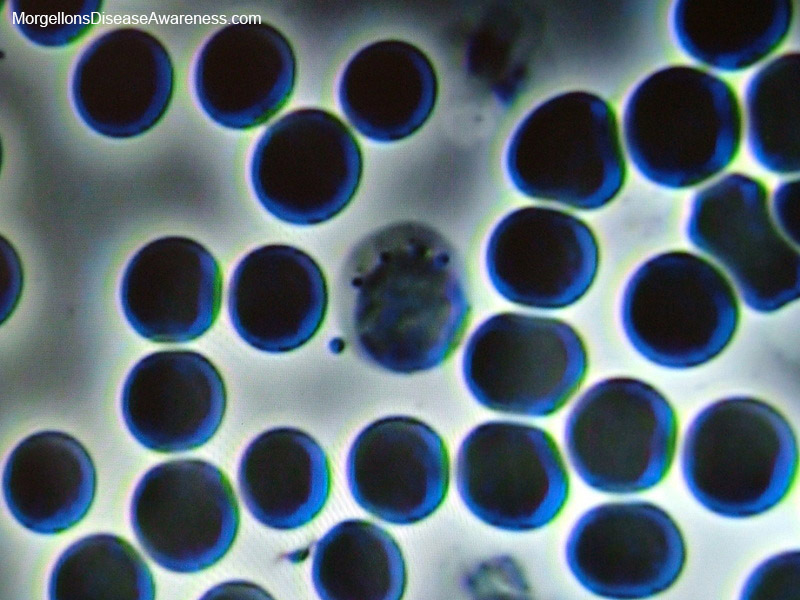 Rick's comments "Healthy blood cells will be perfectly round, nice and dark with a glowing halo around them. Usually, if they have enough moisture inside them they are fully round because there is more pressure inside the cell then outside." 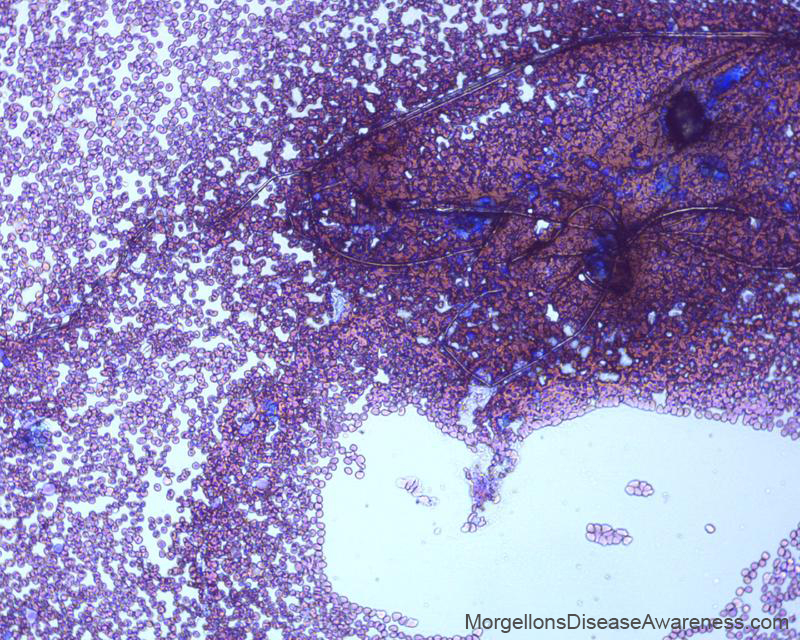 "These 'shadow' or ghost cells were once perfectly healthy cells, you can see by their shape and color that they were—and they've now disappeared into the background. They've popped, they lost their phospholipid membrane. Every cell in the body has a double membrane of fat made up of phospholipids, a two layer membrane. The acids can disentegrate the cell membrane as well as when your body ferments sugar, alcohol is the byproduct, and alcohol can easily melt the cell membrane." 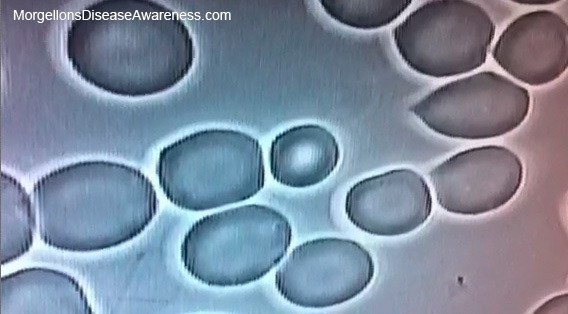 "Whatever is happening in the blood cells is happening to the rest of the body. This will make one tired." (Rick asked if I bruise easily and that answer was YES!). His recommendation was the addition of chia seeds to the diet. Chia is high in Omega 3 fatty acids and are 28% protein and 40-60% fatty acids. More on chia below. 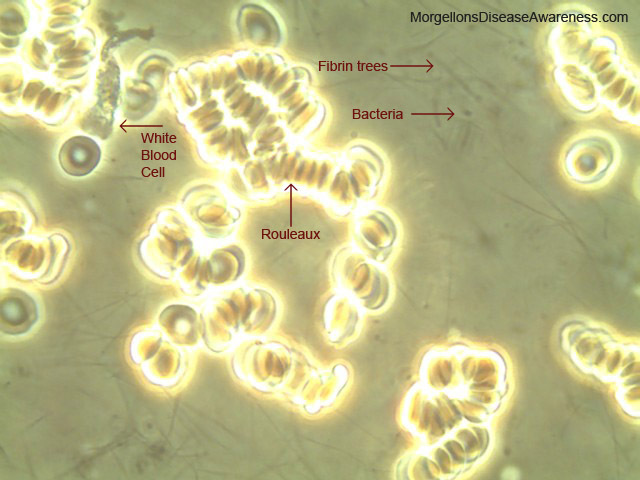 Above: Rouleaux Sticky or stacking chaining of the red blood cells, it's related to poor protein, metabolism and altered pH or acid imbalance, which varies the electrical negative charge of the cell membrane causing them to stick together, rendering red blood cells unable to pass into the small capillaries to transfer oxygen or biologically transform into new body cells and/or remove carbon dioxide or other metabolic acids; resulting in fatigue & tiredness, poor circulation and weak body cells. "One combats sticky blood by ionized water which has massive negative electrical charge which gives its energy to the cells and when properly "energized" they all have a negative electric charge and thus repel each other rather than stack and chain." 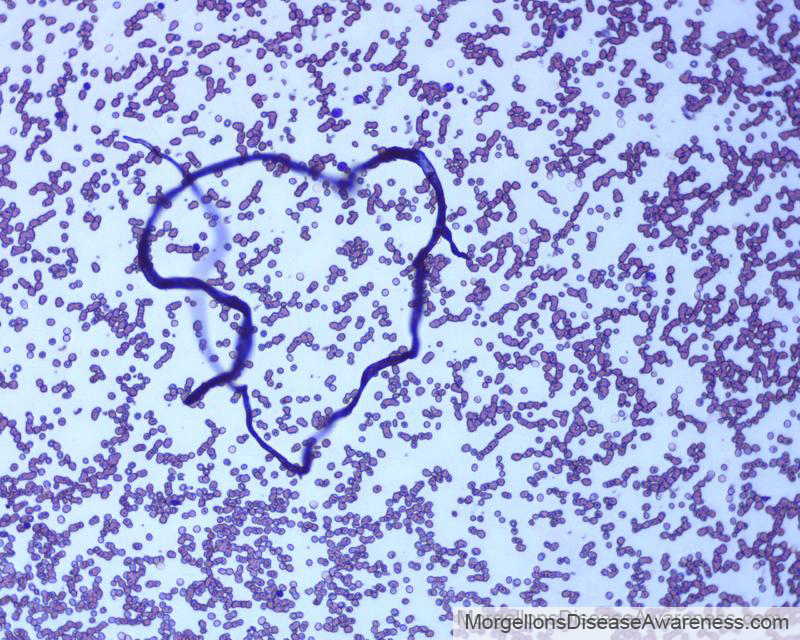 Above and left: Erythrocyte (RBC) aggregation. 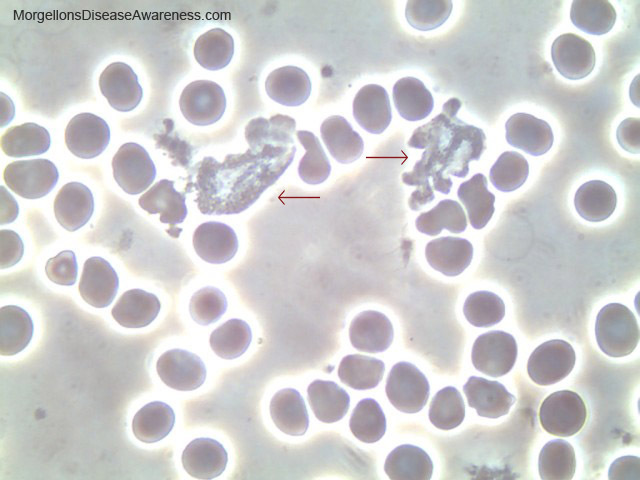 Clotted mass of blood cells due to changes in the cells polarity, loss of natural negative electrical charge. Basically it's a blood clot happening in the system caused by dehydration. 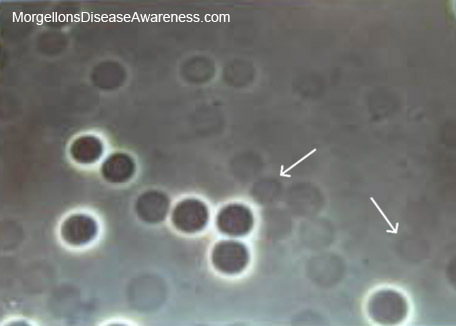 From the literature I was given: "RBCs clumping together in a mass due to a change in the negative surface charge; this is a more disorganizing symptomology where plasma acts as molecular glue, causing RBCs to stick together. This results in poor circulation that leads to cold hands, cold feet, increased body temperature, sweating, hot flashes, water retention, bloating, lightheadedness, dizziness, muddled thinking, forgetfulness and fatigue." 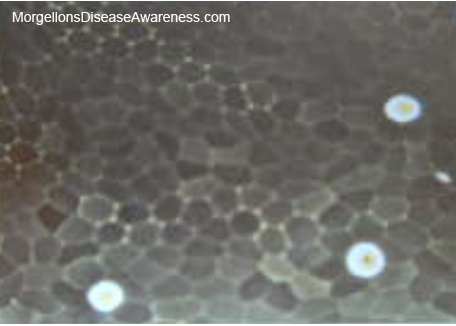 Above: The spaces in between the cells are revealing the hydration level (or lack of). When there are this many cells and this little water, we are looking at the hydration level of the body. I'm dehydrated. 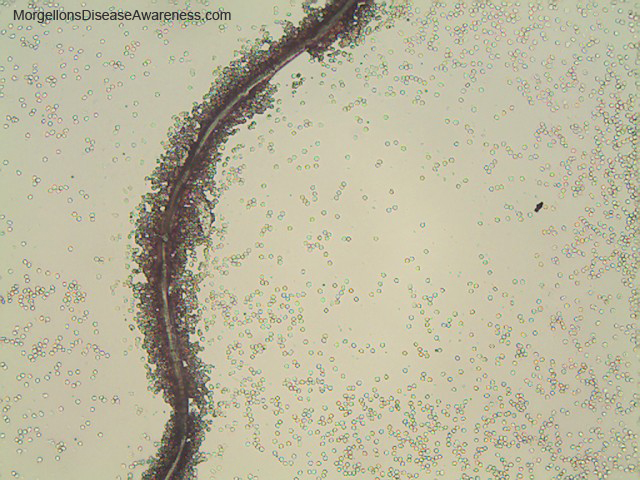 Above: The little black dots are fibrin spicules (bacterial balls) and the cross-hatching pattern in the background that looks like tiny cracks is 'fibrin nets' or 'trees.' 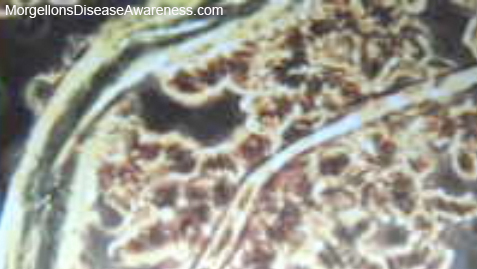 Indicates a high level of latent tissue acidosis. 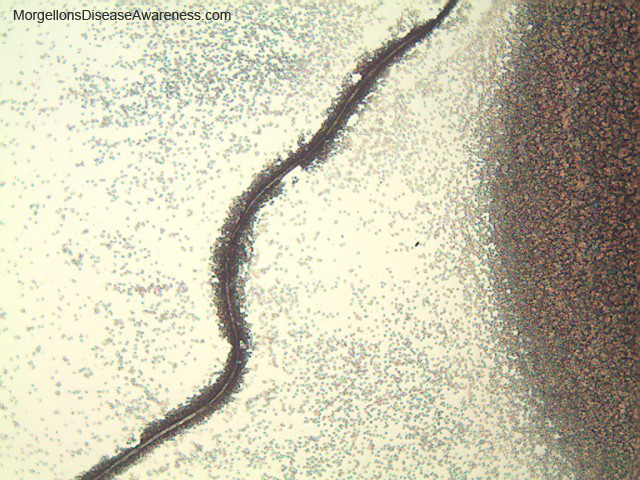 "When the little bacterial balls become more advanced and accumulated, the fibrin nets, like cobwebs form. First come the bacteria—then the nets. These nets act as a defense mechanism for the bacteria so that the white blood cells can't get to them. This system of netting is very difficult on the cardiovascular system because it acts like a cobweb, slowing things down and creating congestion, as well as raising blood pressure." Rick's comments on photos below: "You're gonna want to take a picture of that!" 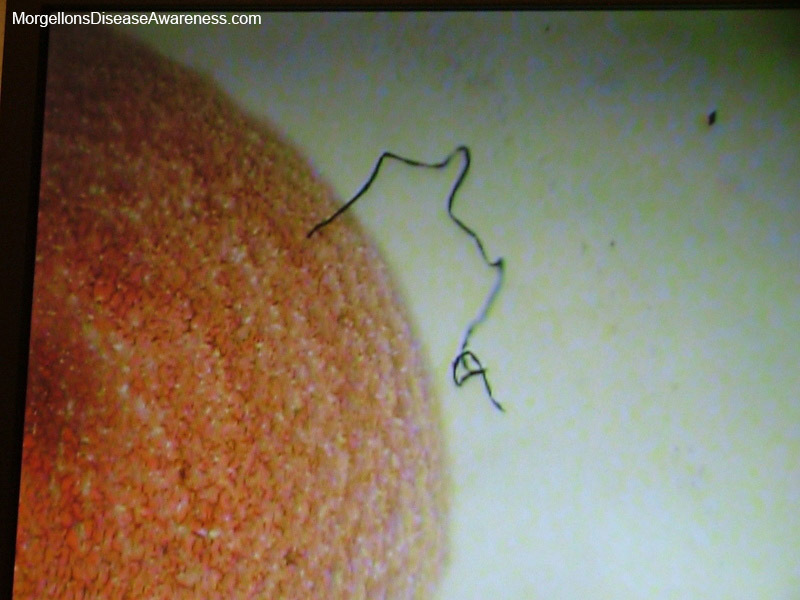 "My first guess would be it's a piece of lint caught between the slides that has nothing to do with your blood. A piece of 'non-you'—because we are not working in a real sterile environment here. It doesn't seem to be biological. Let's call it a fiber...for now. It doesn't belong there, that's for sure. There is no doubt that that is not part of normal healthy blood, and it's way bigger then what I think could survive in your cardiovascular system without being filtered out by your filter organs. That's why I don't think it's a fiber, per se, because it's so big compared to everything else. From a biology point of view, my best guess is that it would be a contaminent that has nothing to do with you. We'll see if we see another one, because if we do, it's clearly not a contaminant—because the chances of there being two pieces of dust on that slide after I wiped everything fresh are slim." We did not see another fiber. Below: some more shots of the 'artifact' as it winds around in the blood. 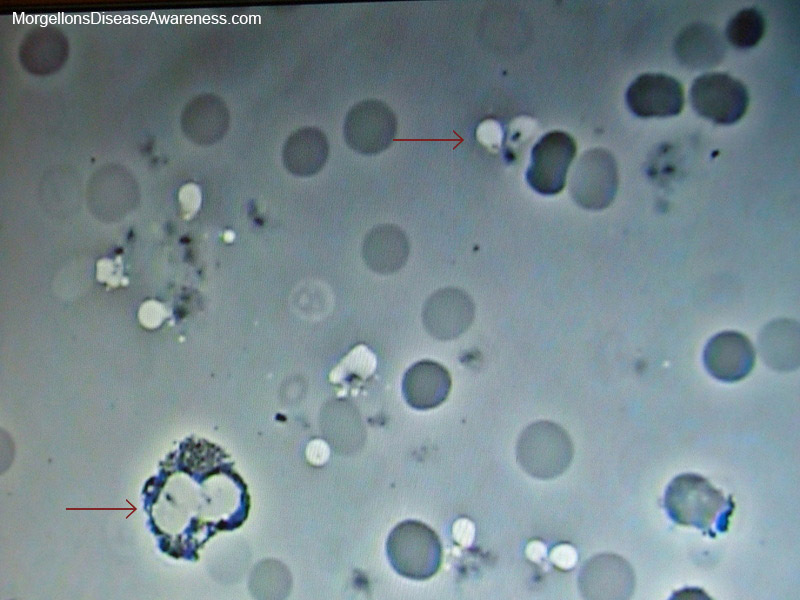 Above: All those white globs in the middle of the cells are yeast consuming the red blood cell—Candida. 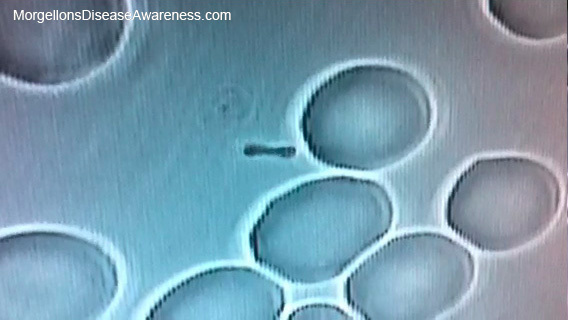 The red blood cells are fermenting as the yeast eats the cell itself. 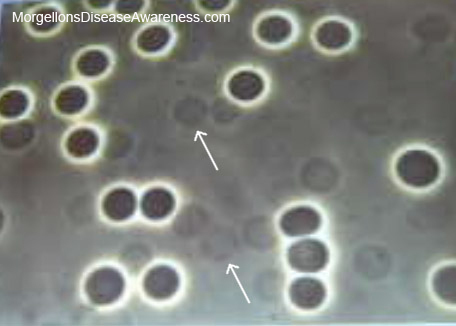 Above: Neutrophils You go guys! The 'garbage collectors' doing a valiant job of gathering yeast and bacteria. They were very active, a good sign. At least there is some good news. My immune system is working. blood. This is due to acid imbalance.Top right you can see heterogeneous symplasts forming. Above: Sugar intolerance Those short lines should be continuing throughout the blood and are not—which indicates sugar intolerance. That whole pale ridge should have snapped to the darker edge. 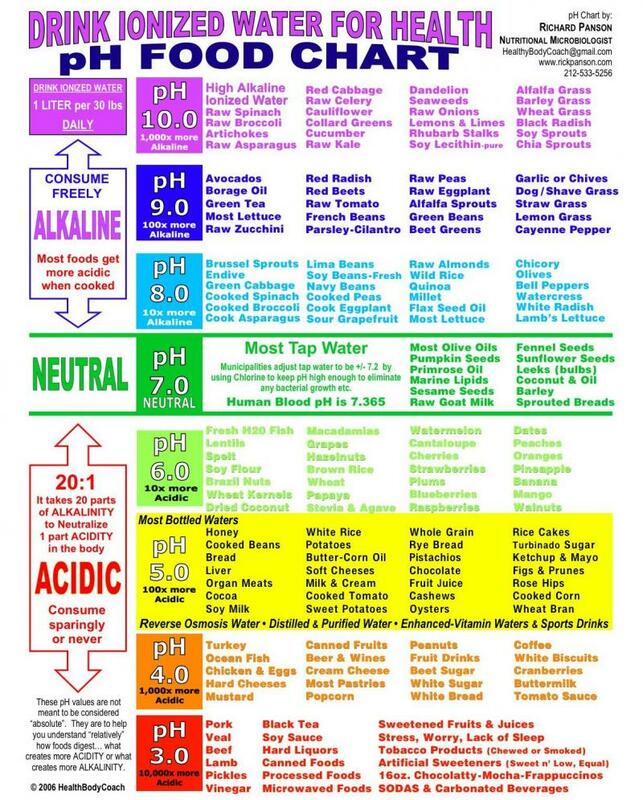 your body makes to try and keep alkaline balance. When you consume baking soda into digestive system, much of it simply neutralizes your hydrochloric acid in stomach whereas when you take it sub-lingual (under the tongue) it neutralizes acids in the body tissues—mostly carbonic acid from carbon dioxide." 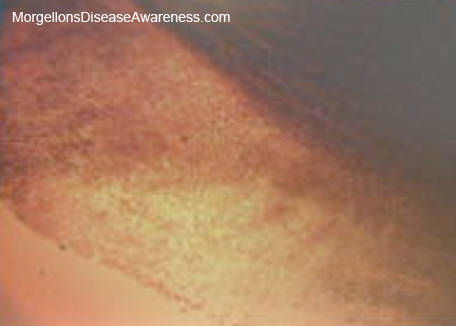 Above: This tiny section of the blood is how all the dried blood would look if it were healthy. There is very little ledge. That's what we are aiming for. 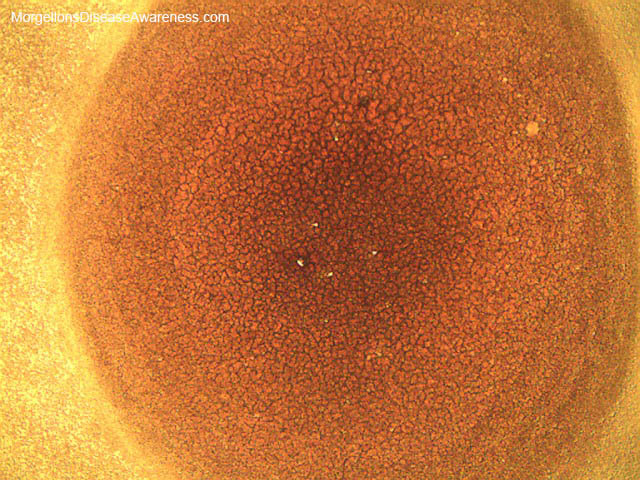 Above: Little white dots in the center are liver stress probably due to the fermentation taking place inside the body because of the alcohol, not that much to worry about there. 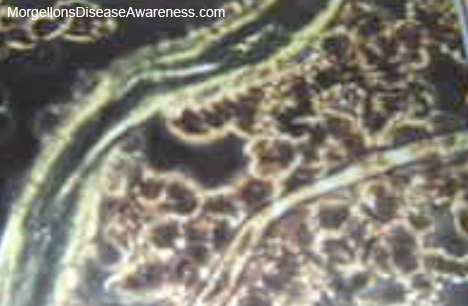 Above: White dots in the middle is bowel toxicity. More of that in image below. I left the consultation with some really good pointers. 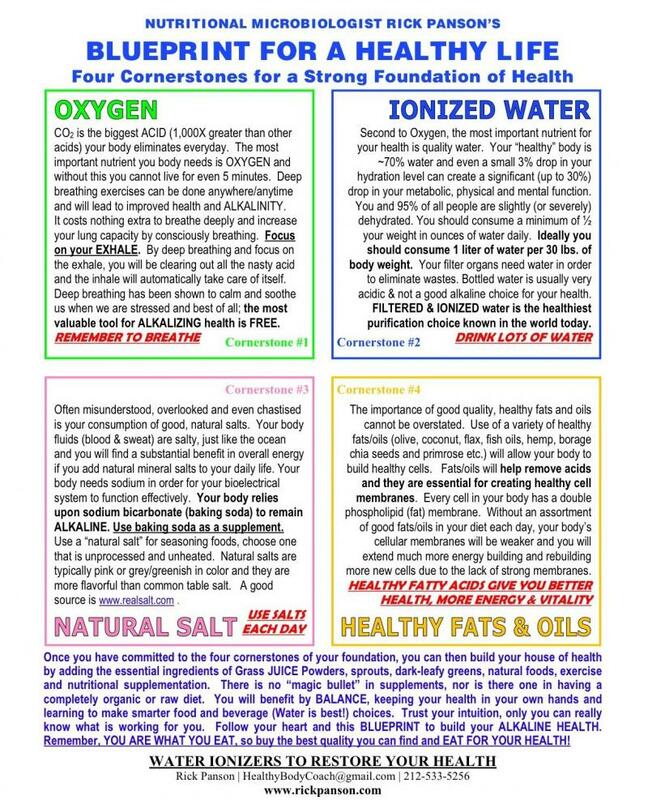 Rick recommended purchasing a GoldFox water ionizer. This is not the greatest water filter but what it does is alkaline the water, so instead of drinking water that is pH 5 or 6, one is drinking water with a pH of 8-10 giving the body a running start on staying alkaline. The benefits of this water are it's antioxidant properties which nullify free radical scavengers, plus the extra oxygen in the water is supposed to give energy and boost alertness and memory. Respiration "The biggest acid you make everyday is carbonic acid. Every cell in your body is producing carbon dioxide from the bottom of your feet to the top of your head that is also surrounded by water and the carbon dioxide plus water makes carbonic acid, that's a very simple thing to keep in mind. By looking for acid based balance the amount of acid produced per day must be equal to the amount excreted or nutralized per day. Not happening in your case. The thing that is happening is, if your body can't neutralize or eliminate the acid you stay at that level, you can't go beyond that level of health. If we can get you to learn how to eliminate more acid and neutralize more acid then it frees you up to get to the next level of health. Blow out the acid, expand the upper rib cage and take long deep inhalations to breathe in more oxyen to neutralize the acids." Rick demonstrated one of the finest ways of getting more oxygen into the body is to expand the rib cage practicing with a harmonica (which he pulled out and played). "You are respirating—you are doing lung pushups. You are taking the chest cavity, ribs and the lungs and trying to get them to be fantastic. Anyone who plays harmonica is going to have really good lung functioning. Breathing is so much more important then what you are eating. Do 10 deep breaths a day 3x's a day (with long exhalation), in one month you are going to have a respiratory function that is 10%-15% better then you have now. Which means 10%-15% more energy and 10-15% less fermentation because fermentation only takes place where there is no oxygen. CO2 is the biggest acid, focus on the exhale to get that acid out. It's the greatest tool you have and it's free." Alkalizing with baking soda "The methods of getting rid of acidity from the body are respiration, perspiration, defecation and urination. Those are the four channels. If you can't eliminate the acids it's a really good idea to neutralize the acids. Take a 1/16 of a tsp. bicarbonate of soda every hour, and take it under the tongue so it bypasses the digestive system." These past few months I've been slacking on checking and maintaining my body's alkalinity, so I'm back on it. Rick gave me a great little tool (from the vet) that allows me to carry the soda in my back pocket making it more convienient to take. The little 1/16 tsp. 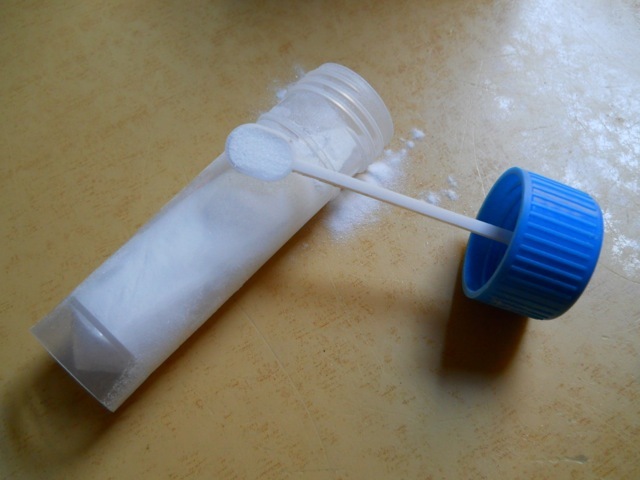 of baking soda will help the system remain in range more than the one tsp. a day method. According to my calculations, there are approx twenty-two 1/16 servings to a tsp. of baking soda, so one can easily be popping it throughout the day. Bentonite clay taken internally in the morning upon rising to detox. This is problematic for those of us taking supplements upon rising which are not supposed to be taken with clay. However, I'm trying to fit it in somewhere along the line. Magnesium oxide also called Oxy-Mag (NOW makes it). Helps with alkalinity and to oxygenate the system. I'm using it as a detox to clean/improve bowel function. The process of oxygenating the bowel breaks down and eliminates solidified waste lodged in the large and small intestines. This is much like a colonic without the cost. Beware, if you take it (up to one teaspoon at night in water with the juice of 1-2 lemons), you must leave time the next morning to eliminate fully. In this way, this process is much like having an enema. Stool will be watery, even explosive. Rick says that eventually this watery stool will cease when the body is cleaned of accumulated waste. Make sure to repopulate with probiotics. I try and do this once a week. Food During our session together I became increasingly confused about food. Rick pointed out that although my diet was pretty good, it was still heavily carbs. All those veggies will eventually turn to sugar so they have to be balanced out with oils and proteins. I was told by Nancy that each meal should have a carb, oil and protein and have been following that for some time. Rick has said the same thing and suggested I start the day with a chia smoothie. "The perfect breakfast would be 2 tablespoons of chia seeds, ground to be chia meal with 2 tablespoons of chlorophyl, (spirulina, chlorella or grass powders (greener grasses, alkavision greens). Ground flax seeds can be added." "Chlorophyll is very cleansing and is a blood builder and it has a molecular structure that looks almost identical to red blood cells. It instantly gives nourishment to the blood. When you take the chia seed and the flax seeds which are 28% protein 40-50% omega 3 fatty acids, that's very little carbohydrate there. The greens are 100% carbohydrate and when you mix them together, now you have carbs that burn like paper and you've got fats and oils, with proteins that don't really burn. The fats and oils are like the charcoal—now you have a sustained burn going on and then you don't ferment the sugars because the coal, the fatty acids, are there. So that breakfast with the chia seeds or flax seeds, or both, and any of those chlorophyls you are using can be a very beneficial superfood breakfast. So easy and so fast to make. Use a lot of water (12 ounces of water), let this all sit for 10- 20 mins. and keep shaking it up to make sure the water is absorbed. Add the chlorophyll products and it will thicken up. They time release and give it back to you so you have have nice long sustained energy with oils, proteins and carbs all day. You'd be surprised, you don't need a lot of food, what you need is the right food." Rick suggested the more chia seeds used, the less hungry one will be. He mixes 1/4 cup chia seed in with a quart of vegetable juice and that is his favorite breakfast. • High In Omega-3 Acids. Chia seed has higher levels of alpha-linolenic acid (ALA) than flax seed. ALA is an essential acid because it is not produced by the body. In fact, chia seeds have the highest known whole-food source levels of Omega-3 acids, as measured by percent of weight. • ﻿Rich In Antioxidants. Chia is a great natural source of antioxidants, including chlorogenic acid, caffeic acid, myricetin, quercetin and flavonols. • Full of Important Nutrients. Chia is an excellent source of calcium, phosphorus, magnesium, potassium, iron, zinc and copper. Chia contains six times more iron than spinach. • ﻿Low In Sodium and Cholesterol-Free. Chia contains less than half the sodium of flax seed, per serving. This is important to those with high blood pressure and concerned about sodium intake. As a plant-based source of Omega-3, chia seed is cholesterol-free. • ﻿Promotes Hydration. Chia soaks up water and this promotes hydration and electrolytes retention. • ﻿Helps in Weight Loss. Chia is very filling. As more Chia is eaten, there's less room for fattening foods. • ﻿Good Source of Fiber. Chia is about 40 percent fiber. A daily serving of chia seeds contains about 11 grams of fiber. About five percent of this fiber is soluble, which can help reduce cholesterol. • Builds Endurance. The Mayan word for Chia is strength. Chia builds stamina and endurance because it steadily releases slow-burning glucose into the bloodstream. • ﻿Gluten-Free. The protein in chia seed is gluten free. Chia seeds are also nonallergenic. • ﻿Provides All Essential Amino Acids. Chia provides all eight essential amino acids. Since essential amino acids are not produced by the body, it's important to get amino acids from nutrient-rich sources like chia seeds. The amino acid leucine is abundant in chia seeds. Research suggests leucine may help regulate blood sugar levels and aid in muscle recovery after exercise. 24-36 months when stored in proper conditions (cool and dry). I saw Rick for a second live blood analysis on November 16, 2012. There has been significant improvement to the blood. 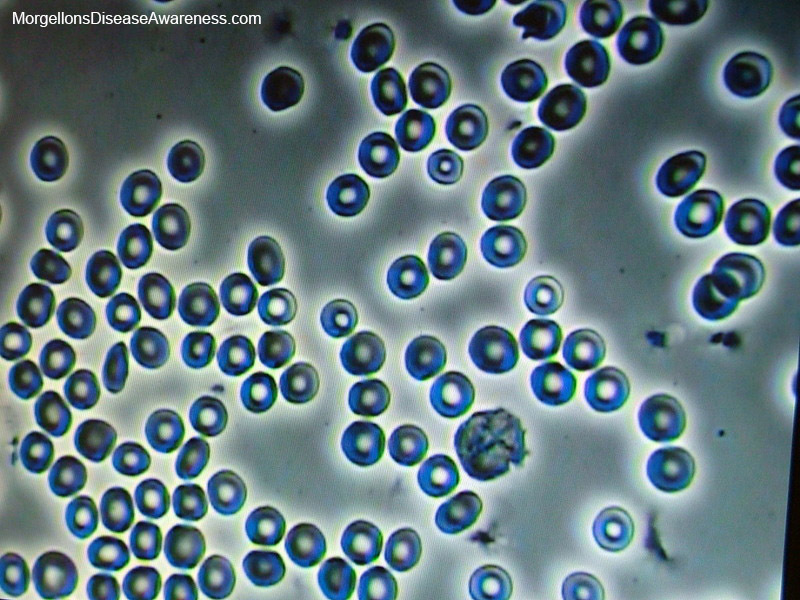 No ghost cells, no rouleax or sticky blood, the red blood cells are fuller, look stronger and are hydrated. The dehydration problem from last session is gone. I'm making a concerted effort to hydrate. 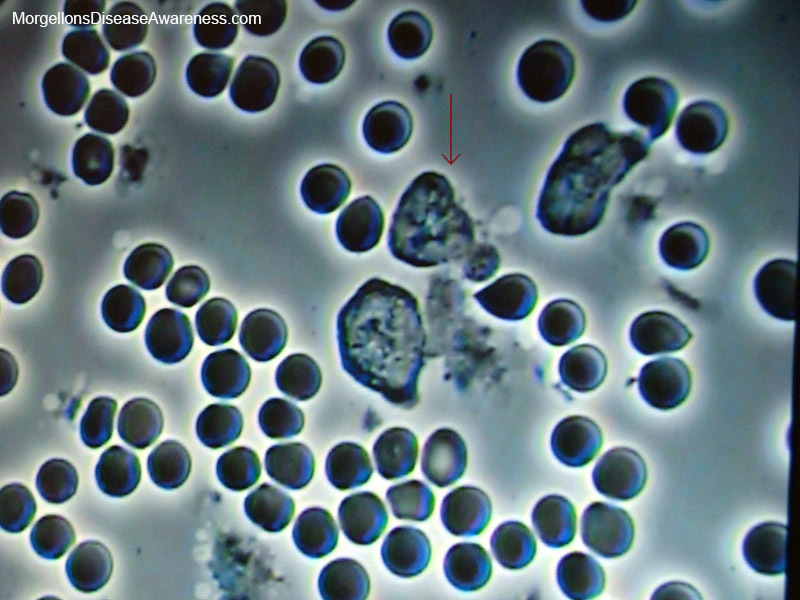 There is nice space around the red blood cells and they were plentiful. 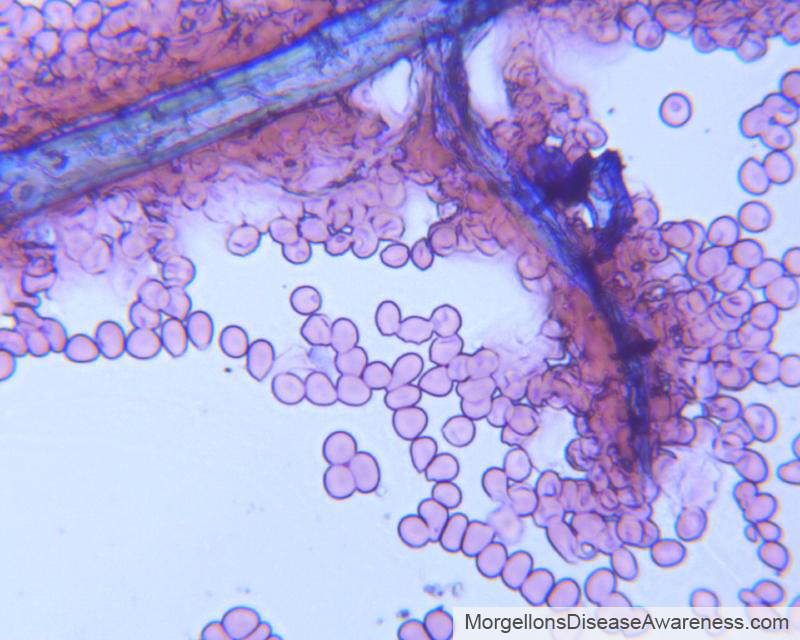 Candida has been greatly reduced in just 2+ months. The treatment of olive leaf extract, caprylic acid and l-glutamine powder as per his suggestion for candida is working. I began addressing it by taking one capsule of both the olive leaf and caprylic acid plus one heaping tsp. of l-glutamine in the morning with my other supplements. After I was sure I had no reactions to this, upped the dosage to 2 caps of each with one tsp. of l-glutamine. Eventually, I added in another dose of these three supplements with lunch. So now I take 4 caps of each a day with 2 teaspoons of glutamine powder. Rick recommended I do this for another month then switch to Candex, but my nutritionist tells me that Candex now has corn (the evil demon) in it. My blood no longer looks like it's dying. 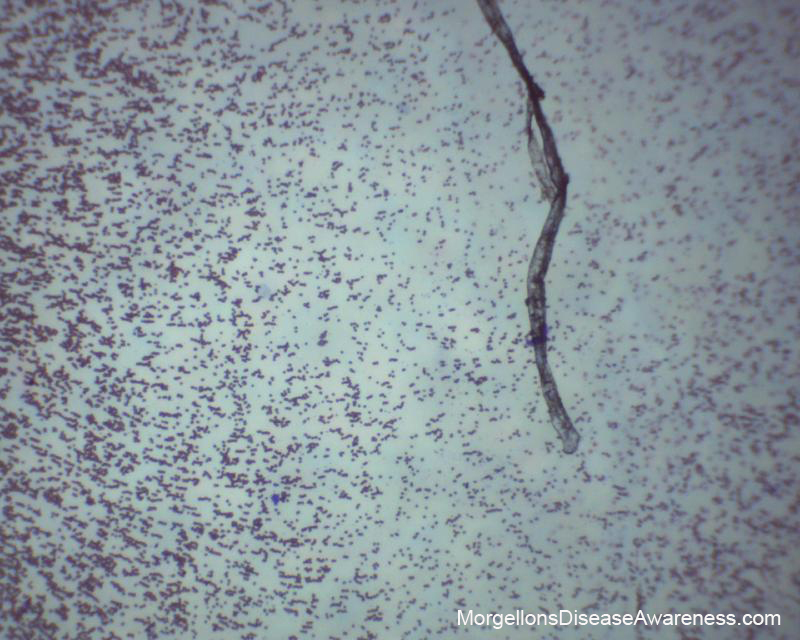 That is not to say that the Morgellons has been effected, we saw two fibers in the dried blood samples. There seemed to me to be more bacteria in the blood and the white blood cells although they are strong and were very active were not plentiful. I attribute the lower level of white blood cell activity to the fact that I was more sedentary these past two months then normally due to a foot problem that kept me off it. Rick suggested that I do lymphatic drainage work using a brush or mitt, followed by getting on a rebounder to jumpstart the lymph moving. That was a great idea. He feels that getting the lymphatics going will produce more white blood cells to remove the bacteria from the blood. The chia seeds in the morning are wonderful. I find they curb the appetite, and help with blood sugar regulation. I still need to take food in the morning or my energy levels get wonky and I get manic, but that is probably just me. Above: Arrows pointing to bacteria. 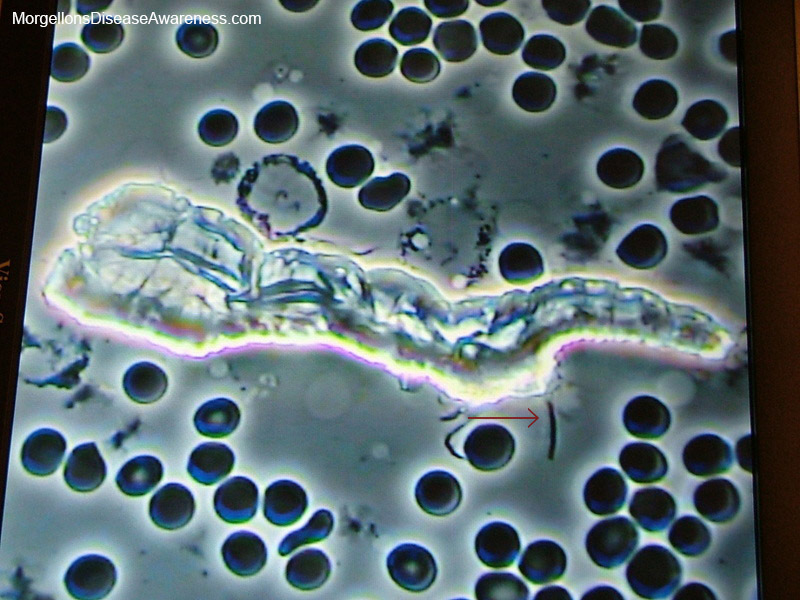 More bacteria being shown below. 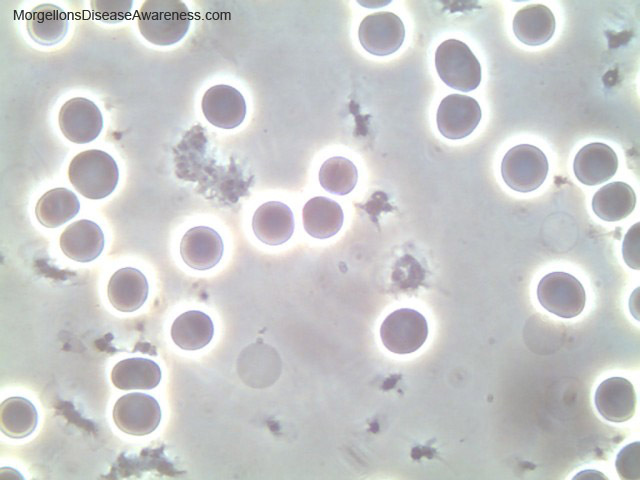 Above: Neutrophils﻿ (white blood cells). They were healthy and active but not enough of them. 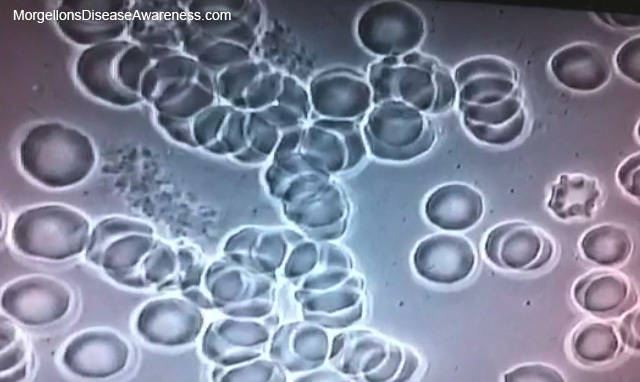 Rick suggests way to activate more white blood cell activity by way of the lymphatic system. "Dry skin brushing with a natural bristle brush will help loosen things up. More white bloods cells are like having more garbage trucks on the street to pick up the debris. How do we get the lymphatic system to become more stimulated? Rebounding (trampoline) is great and hydration too is important. The cardiovascular system—your blood, is very thin like water and the lymphatic system is a little thicker, more like ketchup or honey and even a slight drop in hydration is going to make that more sluggish. Doing some of the things good for the lymphatics like yoga, stretching—even breathing and stretching in the morning, is actually very helpful. Rebounding is fantastic because you're at 2Gs when you hit bottom bounce and you're weightless when you hit the top. Basically the lymphatic system drains to the intestinal system to get the fat out of your body. They say (when doing dry brushing) to draw everything to your heart center. Most people start the dry brushing from their hands and work their way up to the shoulder. Rick described the top of the arm (armpit area) as the mouth of the river and feels dry brushing should begin around the shoulder area to open things up so that by the time you get up to your fingers, the immediate area around the armpit is open for better drainage. I start here from the top part of the arm down and around the whole armpit area—and those bristles are like shaking the ketchup bottle. It doesn't have to be hard, even a ticklish feeling works. If you start by the shoulder you create a vacuum so by the time you get to your elbow you feel tingling—that's because things are moving. It's moving because you've opened up the mouth of the river. Same thing with the legs. Move from the big fat part first before going to the extremities (feet), always moving it towards the heart center. Remember, there are a lot of lymph nodes in the neck, in the breast plate and the armpits, so you can do your face in little circles, you can do your breast with a little softer brush if you like. I like the yerba prima because it's nice and stiff but for the face and breast tissue you might want to go to Bed, Bath and Beyond and get a softer natural brush as some prefer a softer approach. I do my hair/head first and I do a lot on my neck and thyroid. Do the dry brush before showering. Whatever brush you use wakes up the body and allows more of the white blood cells to move. If you understand your vascular system, it has a pump known as a heart and a lot of smooth muscle down the arterial walls that keep everything flowing with pressure through your cardiovascular system. The lymphatic system is more like the drain of your sink. It doesn't have pressure like the cold and hot water and it's passive. Things move by a series of one-way valves and white blood cells once filled with garbage can't go back. They are carrying very toxic stuff, so stretching works, massage works, and dry skin brushing which stimulates everything by way of electrical impulses works. Just by doing these things you find your immune response starts to increase dramatically. It doesn't take much, only about 5 to 7 minutes of dry skin brushing and it wakes you up. 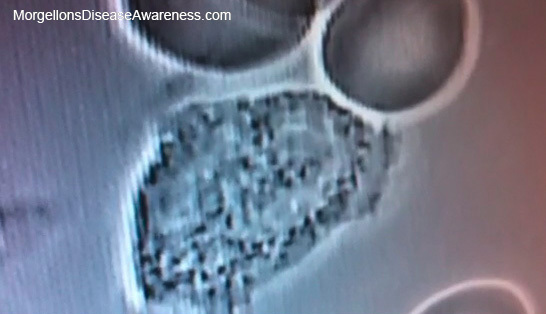 Once the white blood cells fill up (when the garbage truck is full) they go into the lymphatic ducts to be removed from the circulatory system because they are toxic and they are deadly to you once they are full. Then they go to the sewage system to remove it and take it to the sewage treatment plant for processing, your colon, to then be removed from the body completely, so it's isolated from the cardiovascular system. 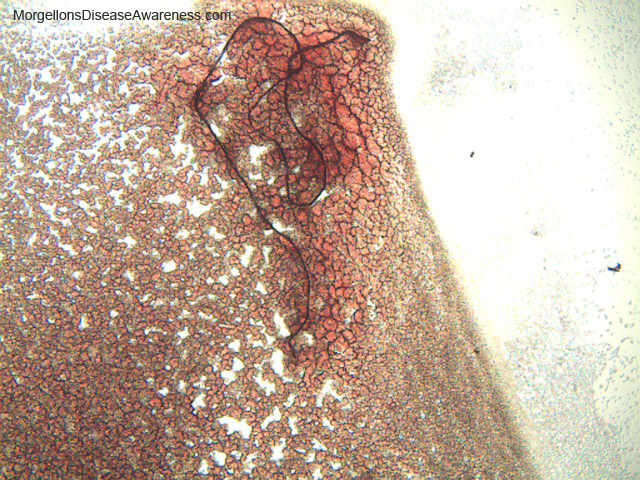 There are lymphatic ducts all over the place and all those little spots where there are ducts and lymph node, those nodes are like little compost piles. The body has millions of them because if they can compost on the spot where there are things that are really bad, it's not so dangerous to move it to the next spot. When the lymphatic system get clogged typically there are things you can do herbally like lymph teas. I like better hydration, because better hydration always helps a great deal with the lymphatics. Number two would be the rebounder, and three would be the dry brushing. The combination of dry brushing before getting on the rebounder is a great one-two whammy (loosen up the ketchup, then get it to move through the system). This will maybe help a great deal in cleaning up the stuff in the blood because it's adding an unstoppable load to you. Just think of a grocery store when there are always customers going through checkout—there is no end to it. The lymphatic system is the arsenal of housekeepers. I asked at this point if there were a way to stop the bacteria and Rick replied that being diligent with pH related as well and I think the body is always going to try and keep up the principles of what you are trying to accomplish. 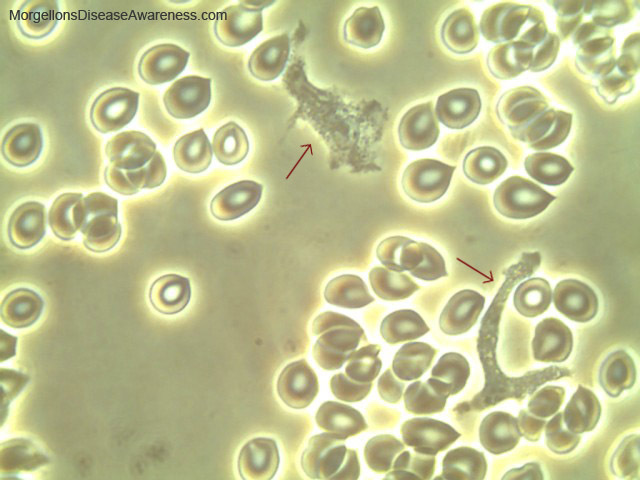 (Pick up at 11:13)﻿"
Above: Candida – Arrow on top is candida being pushed off the red blood cell. 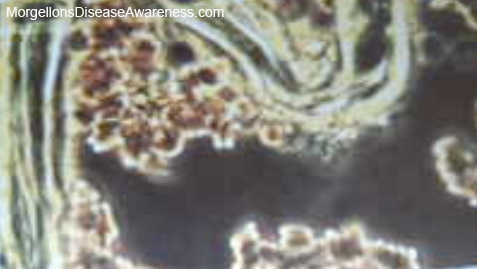 Arrow below is candida free-floating in the blood. 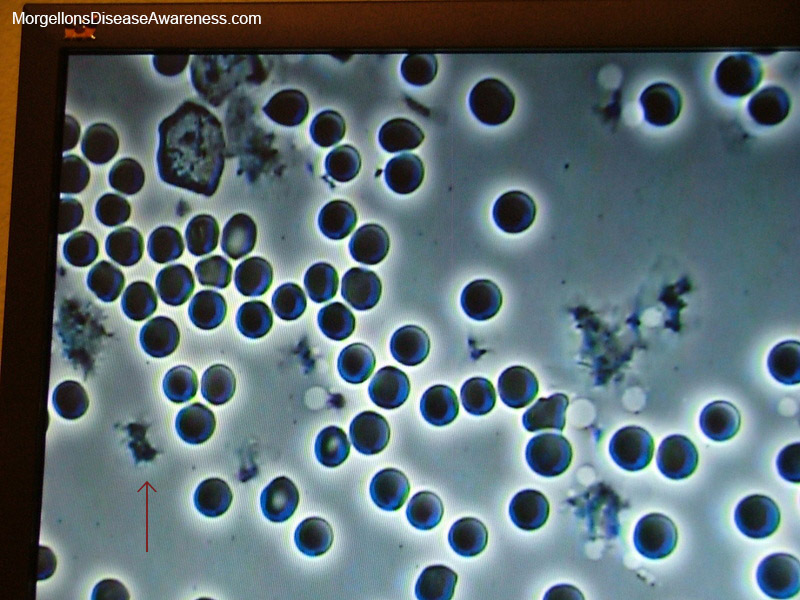 There has been a major decrease in the amount of candida in the blood after 2 months of treatment with olive leaf extract, caprylic acid and l-glutamine but still have more to go. 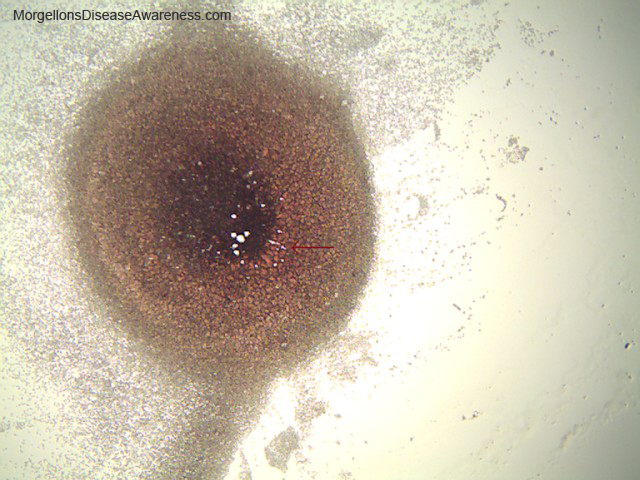 Above: cluster of candida (yeast). 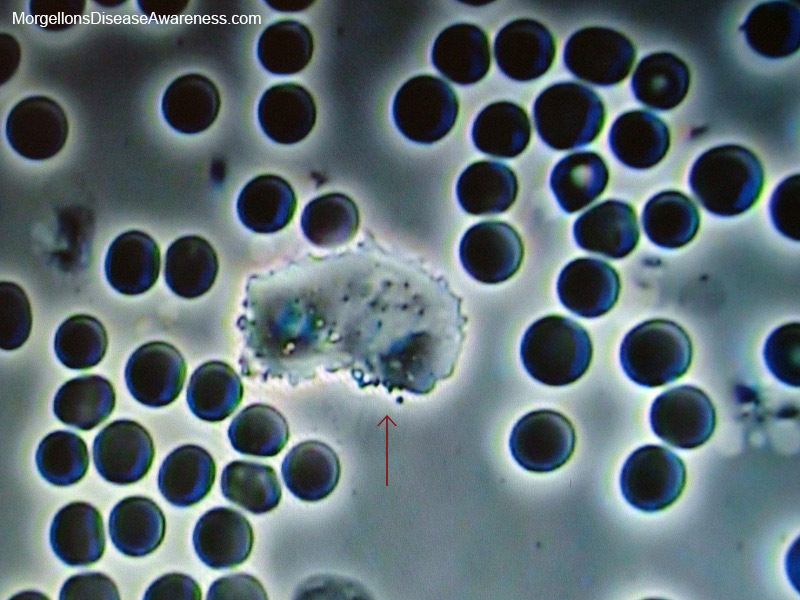 Above: Pteroharps Bacterial cells inappropriately called blood clotting cells, or platelets with crystallized urine around them, bacterial cells that live in their own waste product. Above: The elephant in the room. 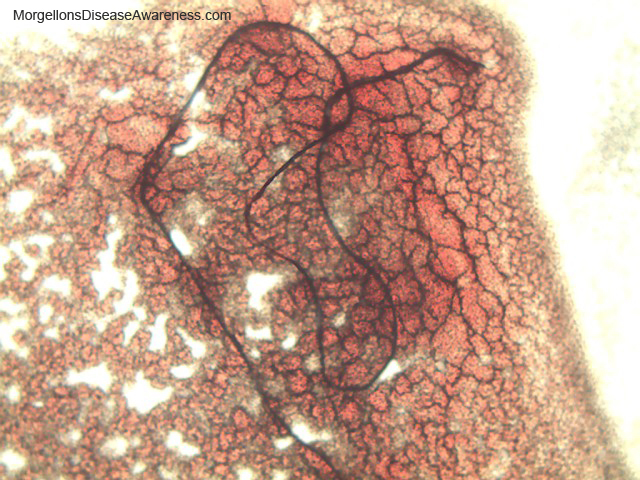 Fiber floating in dried blood sample. Above: 2nd fiber. Red blood cells cling to it. Above: 2nd fiber in super-duper enlargement. Dried blood. Looks like a fiber clinging to it. Above: To come. More information will be added as I finish transcribing the tapes. Rick supplied the following charts for those that want to download them. 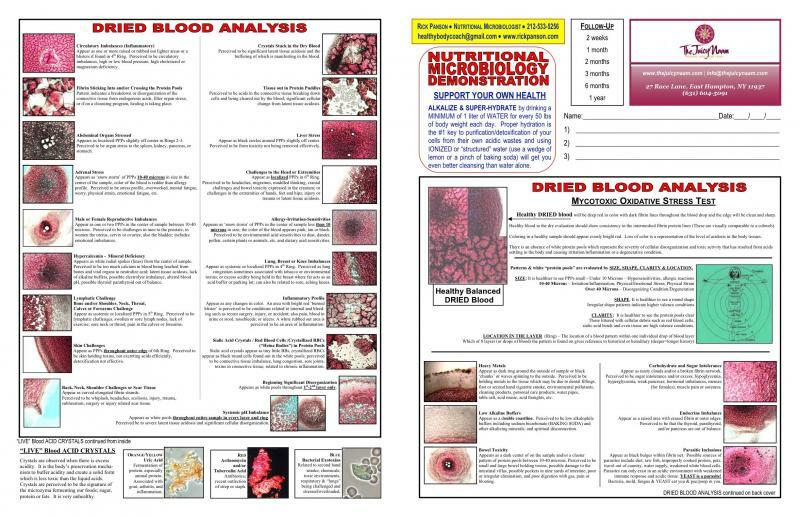 To the right, Visual Reference Guide to Live Blood Analysis. Download the chart below by clicking on it. 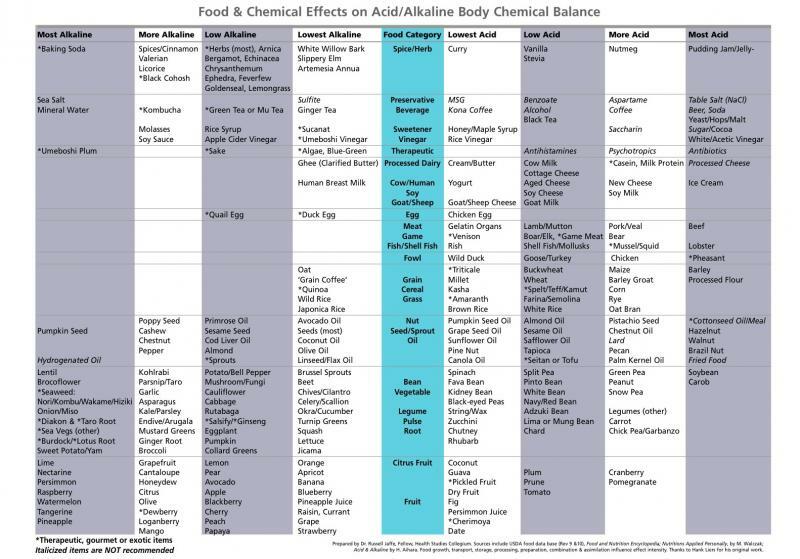 Chart below from the Diet and pH page. To download, click here. 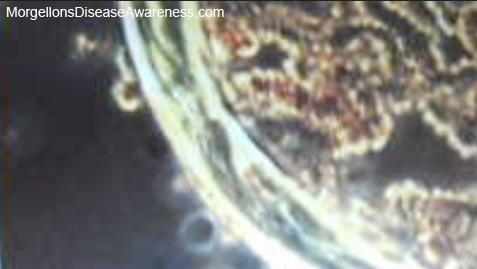 Below images were submitted by ColoradoGirl so that we may start to see what patterns might be showing up among Morgellons sufferers. The images contents were the notes I was given and were not from Rick. Thanks CG for the use of these! Anyone else wishing to submit their live blood microscopy for this page, please email me. Above: The arrows are pointing to yeast. 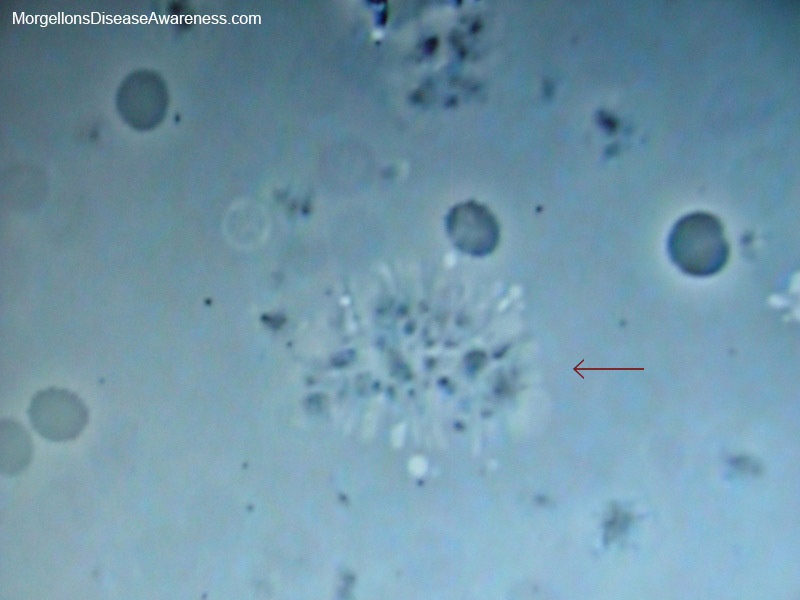 Ghost cells in the background. Black particles are undigested food. Above: Fungal/mold colony. 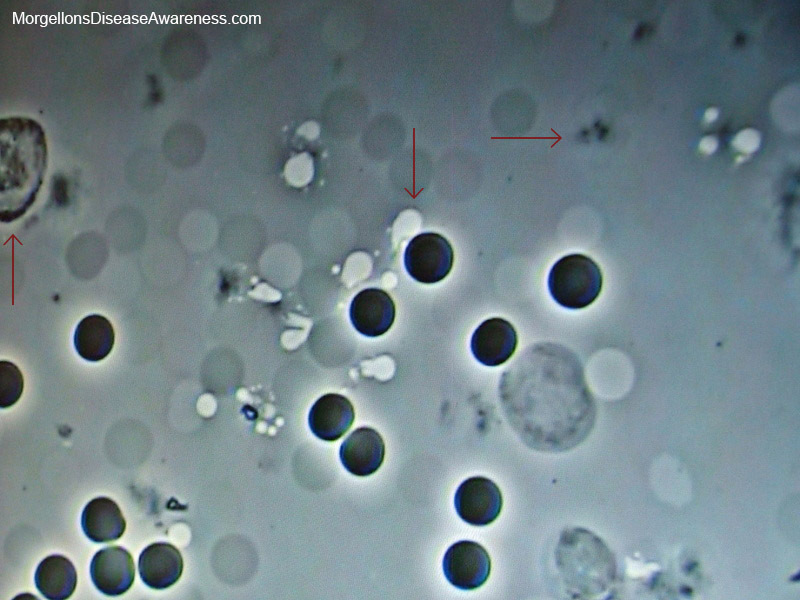 The white spheres above it are yeast (candida). 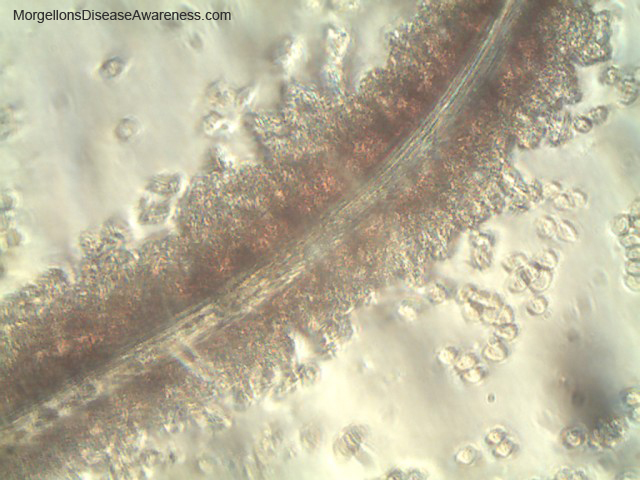 Above: Candida and black mold combining. 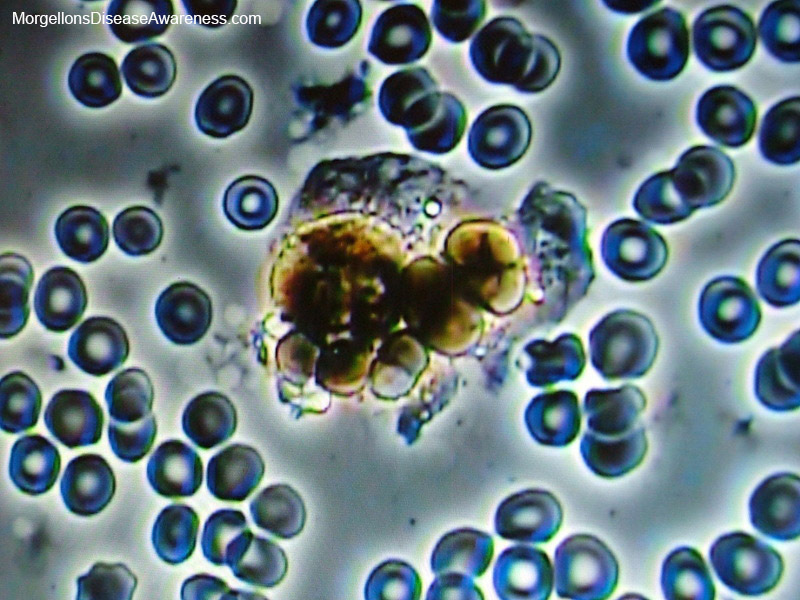 Above: White blood cell engulfing mold. 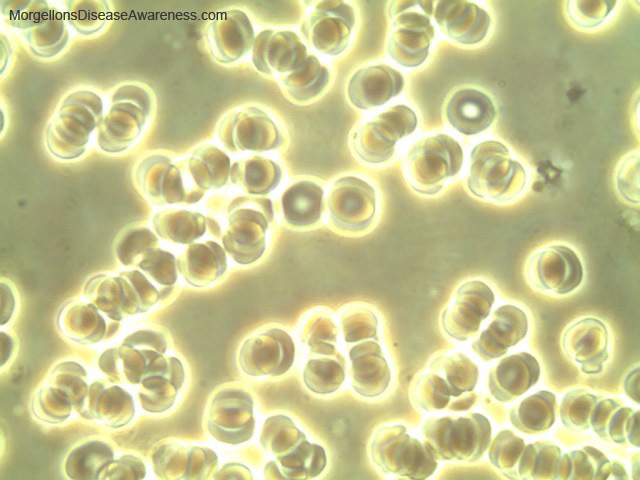 Above: Necrosis Dying red blood cells look like donuts. Blood is acidic. 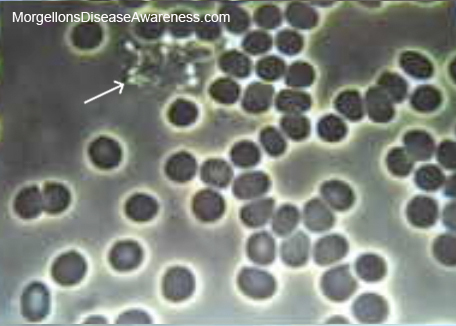 Above: Arrow on the left is pointing to white blood cell engulfing mold and candida. 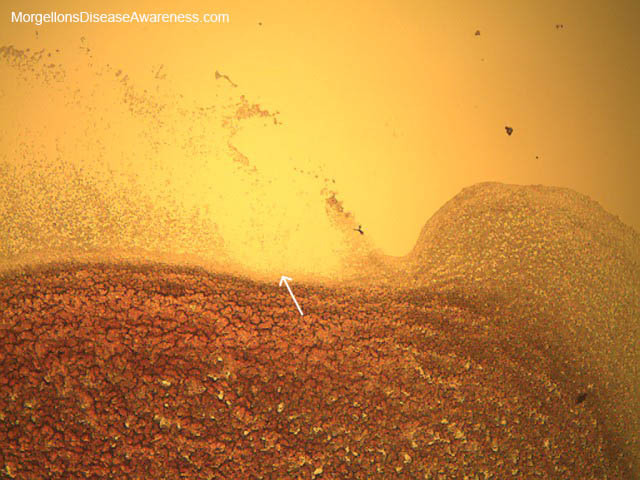 Right arrow, candida and mold. 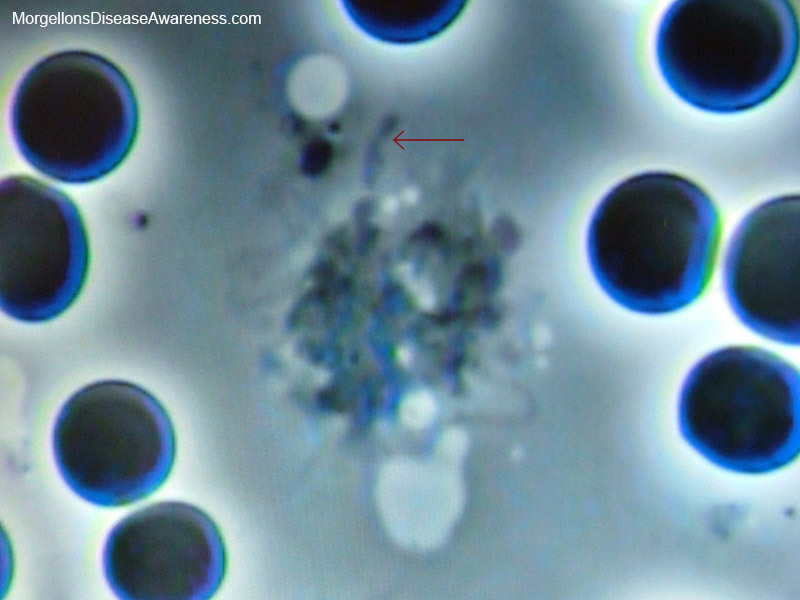 Above: White blood cells trying to engulf colonies of mold and candida. Bottom left clump looks like Heterogeneous symplasts. 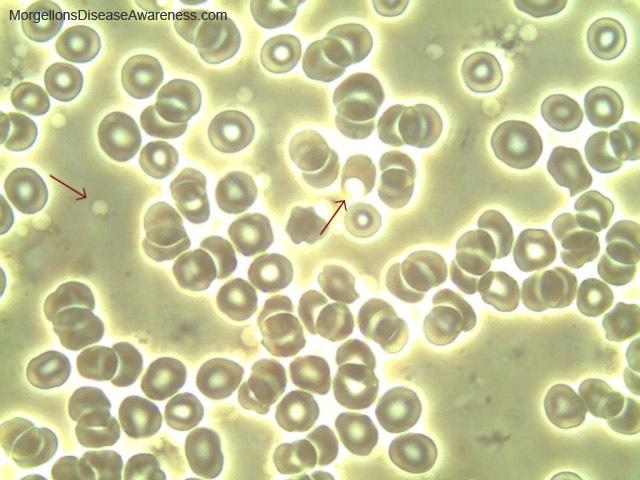 ﻿Above: Arrow to the far left, white blood cell. 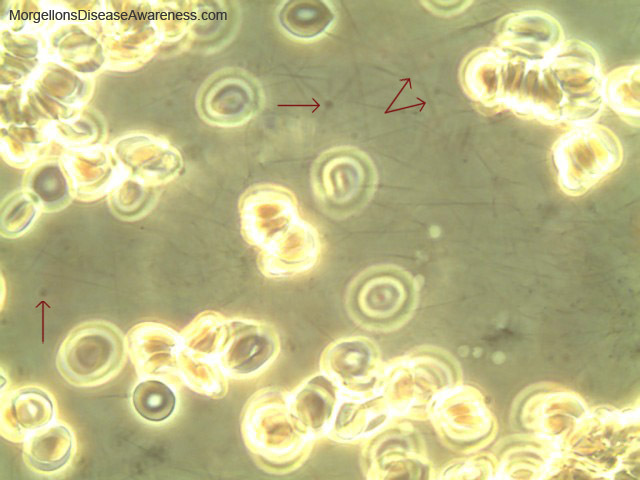 Arrow towards the middle, yeast (candida), arrow to the right, mold. 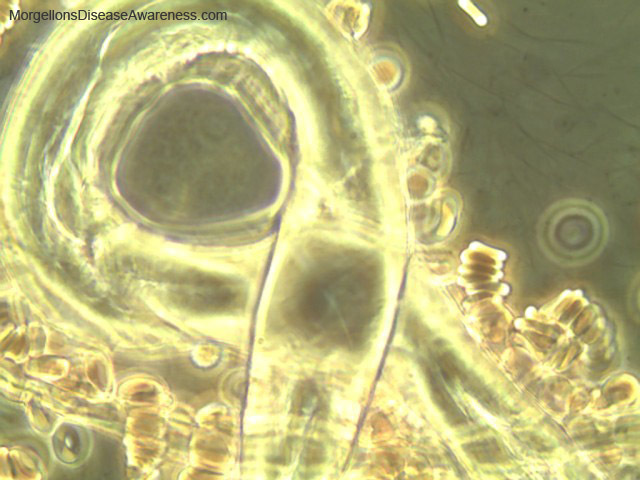 Mold and candida tend to clump. Lots of ghost cells in the background. 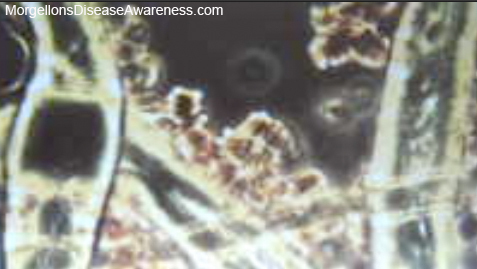 Above: Mold and more candida/mold clump as well as white blood cells trying to do their job. 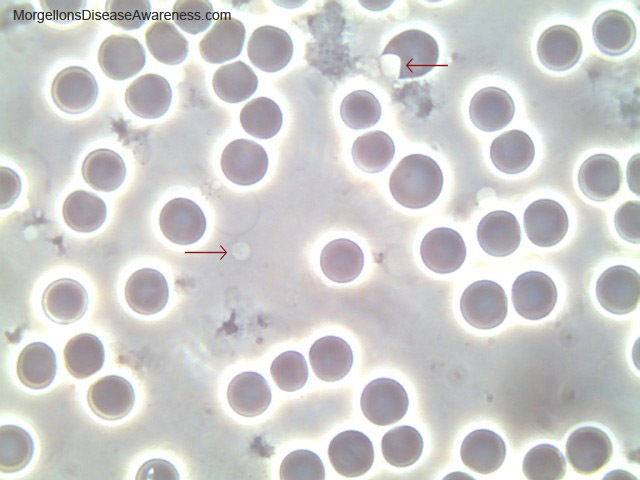 Above: Parasites in the red blood cells. 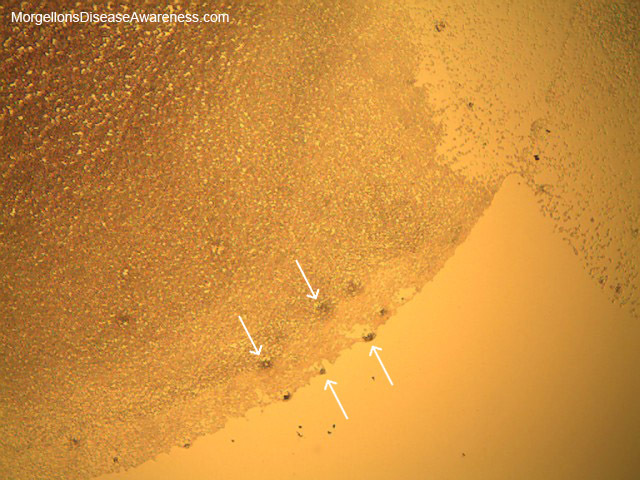 Above: Fibrous Thallus or Colloid Symplast (this is the large floating particle in the image) indicates a nationalization of "garbagelike" bacteria, yeast/fungus, mold and their acid wastes and acid crystals lying in a dormant/inactive state. The diet is too high in protein, carbohydrate (sugar), junk food, experimentation with recreational drugs and or use of prescription drugs. Disregard the pointing arrow for now. Need to get clarification on it. 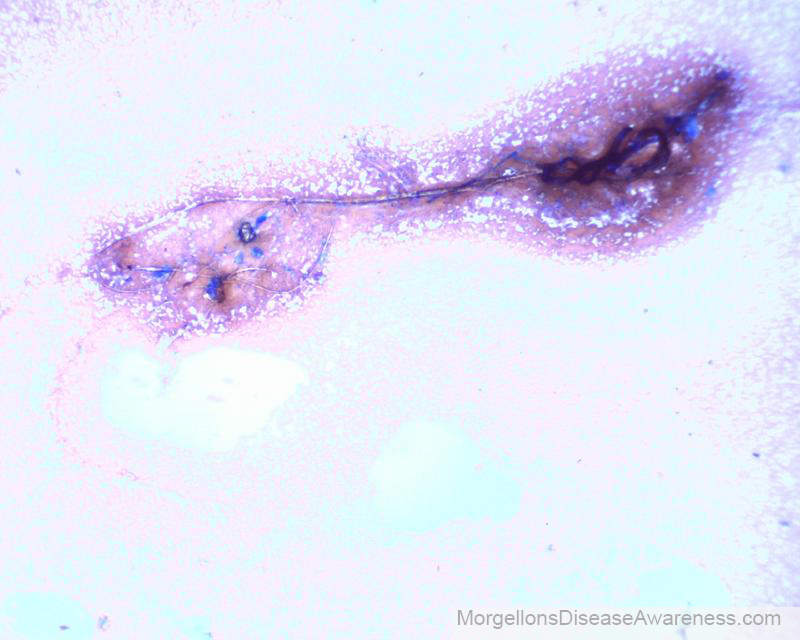 Above: Mold, candida, parasites. The arrow is pointing to a rod shape that was wiggling. 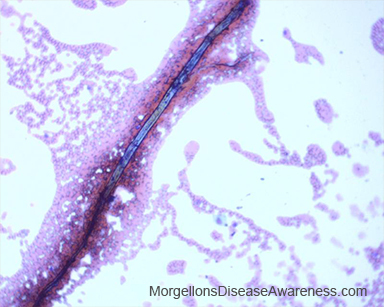 Below: An anonymous submission of a woman with Morgellons. Note the similarity to the fibers in my blood. 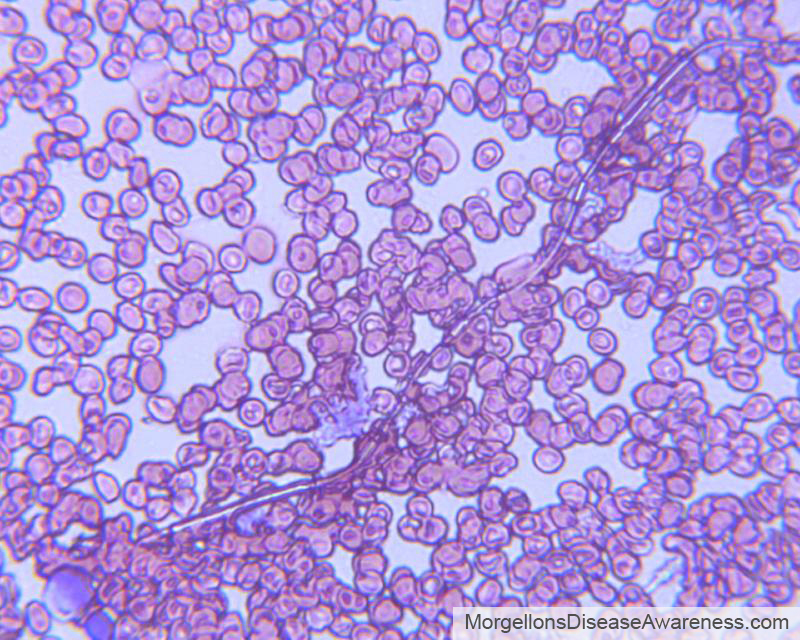 Above: ﻿Red blood cells demonstrating Rouleaux—spread like scattered stacks of coins and stuck together. 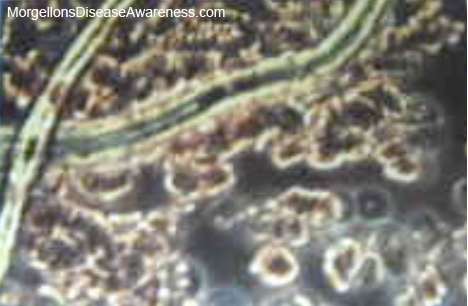 Some are small and weak and show bacteria infiltrating the lipid layers (black dots at or just inside the edges), many have irregular edges giving a lumpy appearance where bacteria has breached the membrane. 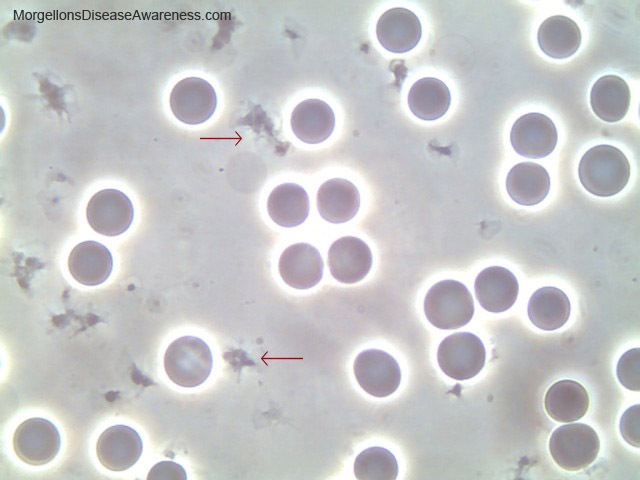 One in particular, on the right side of image middle, is a small old red blood cell that has been very damaged by bacteria and lumpy in appearance. 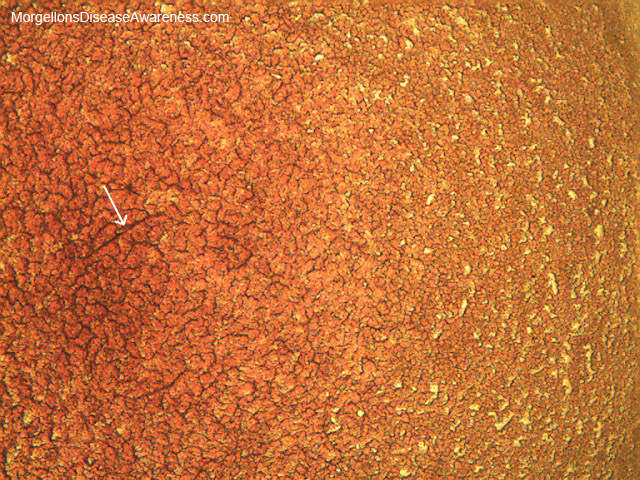 A second very damaged red blood cell is just to the right on the edge of the image. 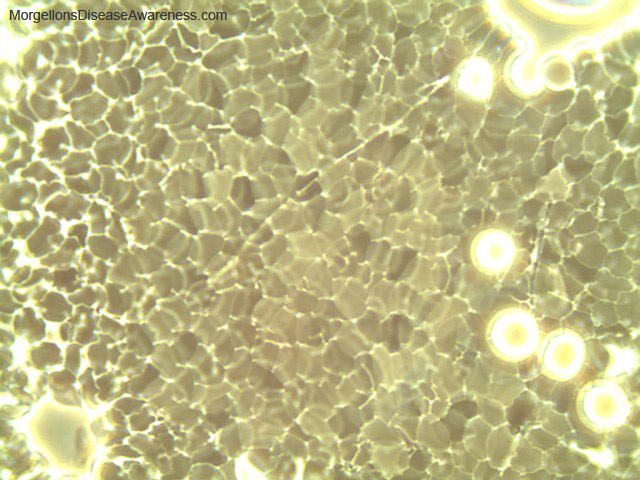 Bacteria can be seen throughout the sample as black dots. 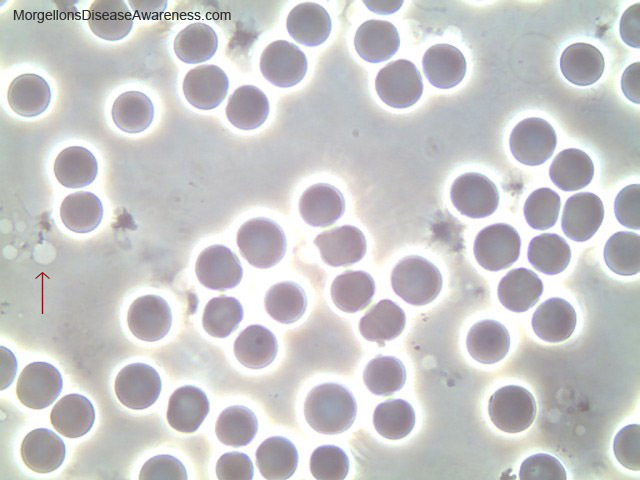 Above: ﻿Red blood cells after having no fats or oils in diet for one month while supplementating with Vit C, multiple B's and Iron: healthy size nicely round and plump, no Rouleaux, no fibrin. 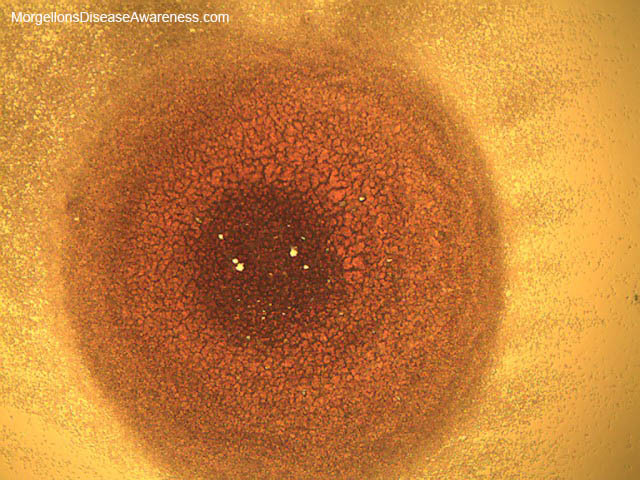 Note the lipid layers as seen by white halo around each cell—thick and intact. 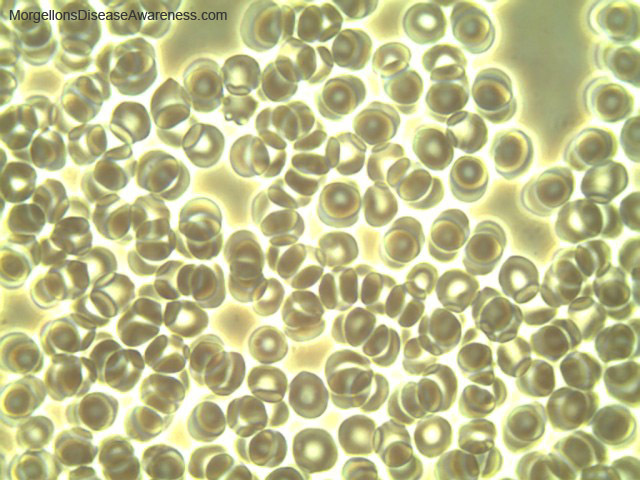 Above: ﻿Red blood cells; very round and healthy with intact and strong lipid layers. 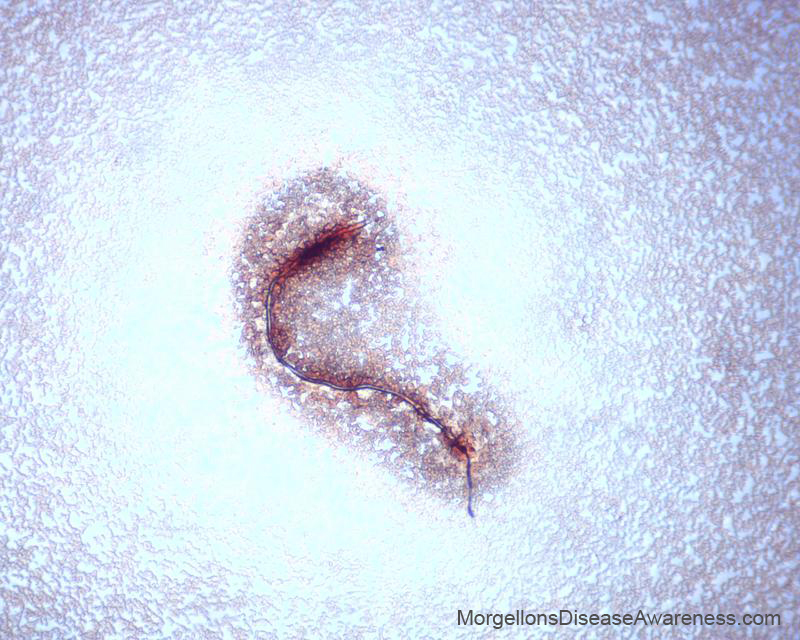 In center, one aggressive bacteria moving in on a red blood cell. 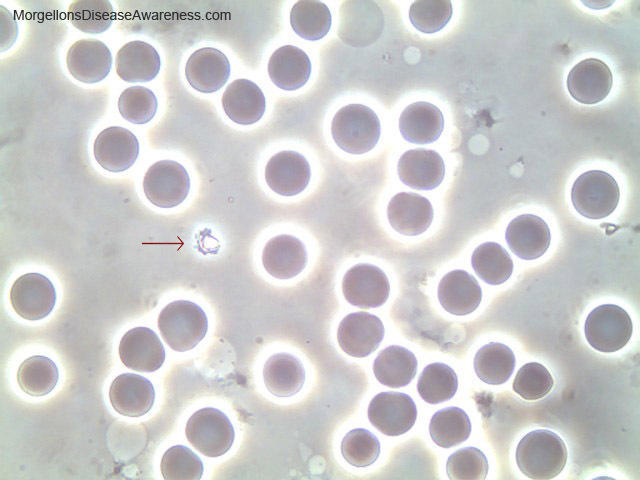 Above: White blood cell not very healthy, center, with captured bacteria. 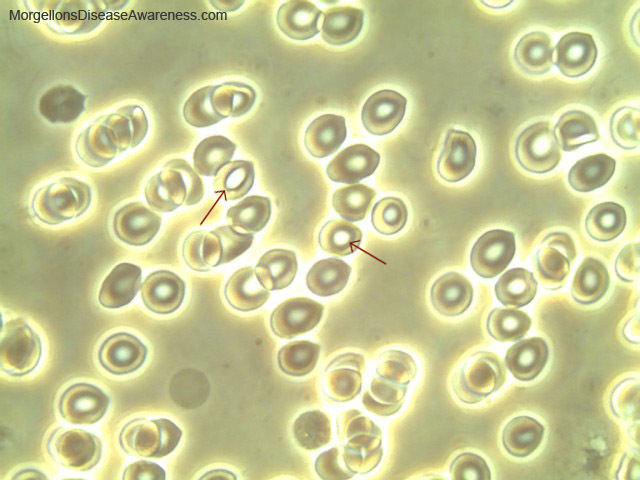 Above: Red blood cells. Top left, very healthy and strong. Others weaker, smaller. Fibrin strands left bottom edge. 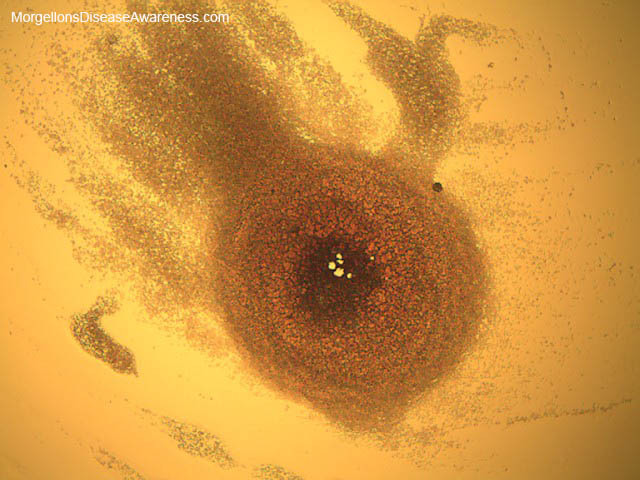 Bacteria lower right, seen as a black dot. 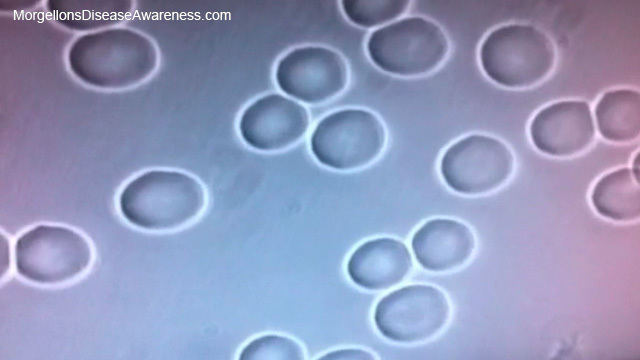 To watch the videos of Kate's live blood analysis follow the links below. Once you get onto her video page, you can negotiate by clicking on the 'next' button.